Princesses who lived happily ever after are never welcome in my home. It’s not because I have anything against two dimensional singing characters in pink and baby blue. My daughter just never liked them herself. Despite my genuine attempts to appeal to her toddler logic that Disney’s perpetually optimistic heroines and now trying hard feminists can be viewed in moderation without any risk of brain damage, she has chosen to set her own preferences. She has ditched the ladies in long gowns and pitch perfect voices for radioactive turtles, the arachnid with four limbs, the knight with bat ears and the man of steel in red underwear. Call me a bad mother if you must but I am having a hard time weaning her from men, women and aliens in spandex. The worst part is that I’ve gotten hooked too. While I do put up a front and exert my full authority to manage her viewing time and habits, I do sneak to my own room with her discs to watch her heroes wreak havoc to prevent havoc. 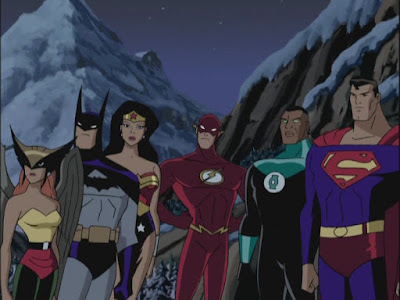 My current favorite is the Justice League, well, the one that includes the rest of the world and not just America in its agenda. While I do still wonder how metropolis can withstand the endless cycle of being destroyed and rebuilt, why superheroes think there’s nothing funny about living with other people in colored tights, why DC superheroes have such unimaginative names, why Superman and Batman can’t wear their underwear underneath their tights and what happens to Wonder Woman’s clothes when she spins into her star spangled undies, I appreciate the controlled depth of the Justice League stories. Who would have thought that these characters, who badly need a fashion consultant, could have such a deep grasp of life’s realities and still be entertaining? At least the eight year old Bruce Wayne probably had all the bonbons he could eat while he was mulling over his business empire’s financial documents and while learning to jump gracefully, mysteriously and safely from 70 storey buildings. The eight year old kid I buy corn from every afternoon is no Bruce Wayne. My friend would probably have to endure more days of trudging underneath the heat of a tropical sun with a basket of corn, not to mention more experiences of hardship that will test his will and motivation to surpass poverty and the lack of education. Right now, he can barely even endure not being a child as he cranes his neck from outside to get a glimpse of the Justice League on our television set. My friend is not the only one. Watch Wish Ko Lang every Saturday and you will realize how many other Filipino children have stopped being kids at the age of eight. They are everywhere selling goods, polishing shoes, massaging tourists, clinging on jeeps and picking pockets. How much more emotional and physical trauma do they have to endure before they can transform into masked heroes to save themselves and their families from the poverty of Filipino life? If only these kids could all surpass the tragedies of life to become Bruce Waynes, Clark Kents and Dianas. We sorely need a Justice League of the Philippines. At one thing na napansin ko sa mga batang un..hindi na tlga cla bata. ung mga ginagawa ng matatanda gaya ng panloloko etc. ginagawa nila. unfortunately ndi cla katulad ng mga justice league na un na isang ikot lang bumabalik na sa totoo nilang pagkatao..
ung mga batang un habang buhay na clang napagkaitan ng kanilang kabataan. talagang nakakalungkot ano webster? masakit man isipin pero ang ibang mga adults na galing sa napaka hirap na childhood ay mga villains na ngayon. sigh. awwwwwwww! your daughter is so cool! what's her name again? sophie? sophia? Supposedly, our moderator was going to be this brother people call Brother TJ, but when I last talked to Sister L. she said he's too busy with counciling work to "moderate" a school paper. But he'd be more than happy to help daw. So I don't really know if we're getting a new moderator or not. I haven't talked to the guy yet. Sister L. said the screening will be next week. I've already come up with a list of possible candidates, and it's pretty long. 25 people to be exact hehehehe. 6 seniors, 10 juniors. 7 grade schoolers. sophie's so cool!!! erm - do you think she'll want to watch dark knight? uncommon set of characters to enjoy for a kid, by the way.